Ponca, one of northeast Nebraska's earliest communities, was platted in 1856 by Frank West and laid out by Dr. Solomon B. Stough. The town was named for the Ponca Indian tribe that inhabited the area when the first white settlers arrived. The location provided an abundant supply of wood and water. Originally part of Dakota County, Ponca was named as the seat of government when Dixon County was organized by the Territorial Legislature in 1858. The first county business was conducted in the Frank Ricker and Brothers general store. Water power from the Aowa Creek basin contributed significantly to the early growth of the community, which boasted flour and saw mills by 1861. Development slowed during the Civil War and the grasshopper plagues of the 1870's. The 1876 completion of the Covington, Columbus and Black Hills Railroad, the county's first, marked the beginning of a new era of economic growth. During the 1890's Ponca sported one of the finest one mile thoroughbred racetracks in the Midwest. In 1934 the Civilian Conservation Corps began the development of the original 220-acre site of Ponca State Park on the banks of the Missouri River. This park has become one of Nebraska's finest outdoor recreation areas. 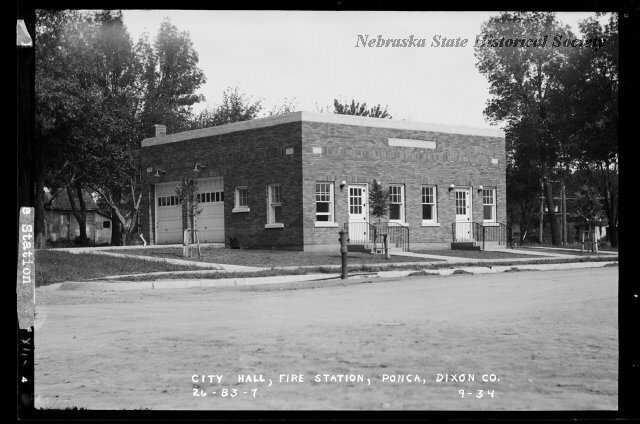 “Ponca,” Explore Nebraska History, accessed April 19, 2019, https://mynehistory.com/items/show/155.